ISS QualityScore offers institutional investors a data-driven scoring and screening solution for ESG investment risk. 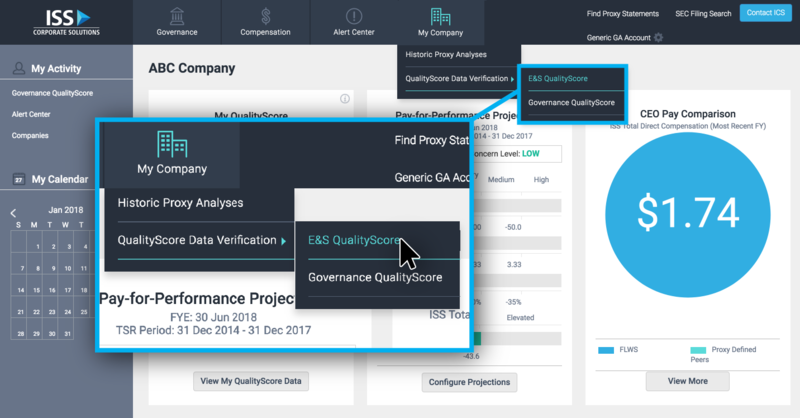 All companies within the ISS QualityScore coverage universe can review, verify, and provide feedback on the data used to determine their scores via a Data Verification tool accessed through the Governance Analytics platform. Submissions of corrected or updated data can be made online quickly and easily through the platform. To verify your data, you will need to login to Governance Analytics. You do NOT need to request a new login and can proceed directly to the Governance Analytics website. Data verification is not available during the period between the filing of a company’s proxy statement and the publication of ISS’ proxy analysis for the company’s annual meeting. An issuer need not be an ICS client in order to participate in the corporate issuer data verification and there is no fee associated with data verification. Click on the Submit button to request data changes.